With the growing number of patients who self-inject medications at home, the number of needles that need to be disposed of is growing, as well. The U.S. Food and Drug Administration recommends that these items be placed in an approved container and be taken to a facility with the ability to properly destroy them. Unfortunately, these services are not always available. To address this expanding concern, the staff at Penn State Health Milton S. Hershey Medical Center will be accepting needles and syringes as part of its Drive-Thru Prescription Drug Take-Back event on Saturday, April 30 from 10 a.m. to 2 p.m. at the Academic Support Building, 90 Hope Drive. The event is offered for the safety and convenience of the community, providing free, easy, and safe disposal of unwanted, unneeded or expired medications. According to Kimberly Cimarelli, pharmacy manager at the Medical Center, the service of accepting needles and syringes was added to the drug take-back initiative at the Medical Center last year because of the lack of free or inexpensive options. These items are usually disposed of using expensive mail order programs. In 2013, the American Nurses Association (ANA) estimated the number of needles used at home was quickly approaching 8 billion. That number did not include devices, such as lancets and other such instrumentation, used by patients with diabetes to prick their fingers. According to the ANA, injectable medications include those used to treat osteoporosis, multiple sclerosis, HIV, hepatitis C, cancer, infertility, allergies and psoriasis. “An increasing number of patients are getting their medications at home and need to give themselves injections,” she said. Cimarelli believes that the cost and lack of convenience are the reasons people resort to improperly disposing of sharps in the trash, which causes safety concerns. In the absence of an FDA-approved container, some people have used laundry detergent containers. These containers still need to be marked as a ‘biohazard&apos; and disposed of correctly. 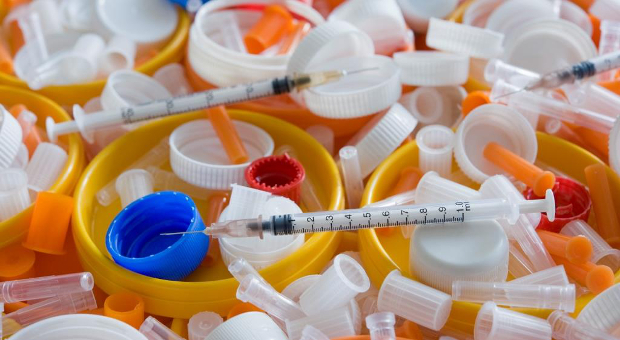 “State regulators do not provide written recommendations for disposing of sharps, but it is the responsibility of the patient to dispose of them properly,” she said. Needle destruction and melting devices are another option, but both are costly, as well.